When it comes to decorating a space for children or deciding on how to best use that space, things can get tricky. I’ve learned when planning spaces for kids, it’s best to see them as mini-adults that run their own businesses. This may sound silly, but think about it… they often need their bedrooms to function for living (play), sleeping and working (homework, crafts). You need to create a space that multi-tasks. 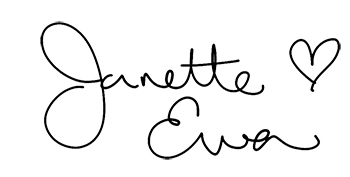 In this blog I want to focus on the work-play space. Whether you have to fit all these activities into your child’s bedroom or have the luxury of a set “play” space, following these tips will help you put together a work-play space that your child or children will love and will grow with their needs. Color: Keep it neutral, calming and soft (soft blue or green), with so many toys and accessories you’ll need to bring calmness in where ever you can. Paint should always be semi gloss (easy to clean). Paint one wall with chalkboard paint! 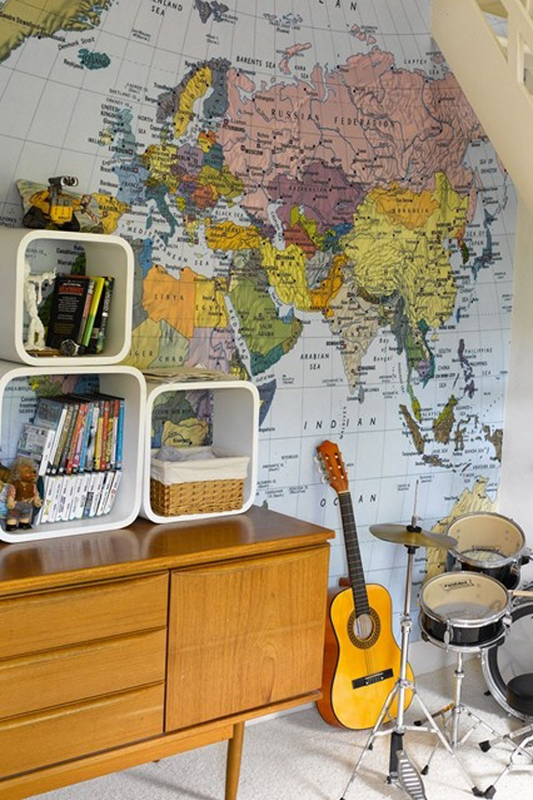 For older kids change the look of the room with the addition of wallpaper- washable of course! Flooring: Vinyl is great and easy to clean (as are some hard woods). Always bring in a super soft carpet (avoid shag because it’s hard to clean!) so the kids are comfortable when on the floor. Define the space: Create distinct spaces that meet the child’s many needs. These spaces should include the following: craft/art space, learning/homework space, play/toy space, display space and a reading space. •Craft spaces for little ones should always include an area for drawing and painting standing up, a small table and chairs and plenty of accessible supplies. •For younger children include an “imagination station” this is for dress up and make belief accessories (tickle trunks can go here as well as a puppet theater). •Craft spaces can become more mature as kids grow, cater them to whatever your child’s specific hobbies are (sewing, fashion, guitar). 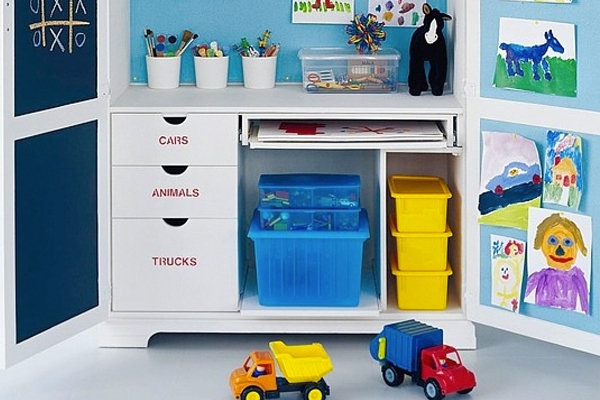 Storage and Organization: Storage for the little ones should be low to the ground and easily accessible. I find that a high quality bed with storage underneath can be the perfect “stash” place for toys and art supplies, even oversized homework and school projects. As kids grow storage can move upwards, bring in taller book cases, filing cabinets (to store homework), have two types of storage systems, one for play, one for fun stuff (crafts, art supplies). Keep storage streamlined so it doesn’t get cluttered looking. Teach your children a filing system to keep homework assignments organized. Create an in/out box for kids and Mom/Dad – for permission forms, report cards, birthday invites – because it’s great for keeping both the parents and kids on track. Furniture: Play furnishings should be lightweight and easily moved. Heavier furniture, sofa and desks, should be sturdy and solid and well made. Shop for furniture that grows with your child. Look for desks and tables that have adjustable legs and height. Also look for bedroom sets that provide “distinct” work areas. Consider a larger desk (where two children can sit) or two desks face-to-face. With so many collaborative projects kids will need a place to work with project partners.